Biography of Impressionist Painter, Heidelberg School. Charles Edward Conder was born in Tottenham, London, the third of six children, of the civil engineer James Conder, and his first wife Ann. At the age of two, he travelled with his family to India where his father had obtained a post as a railway engineer, but following his mother's early death in 1873, he was sent back to England to be educated. 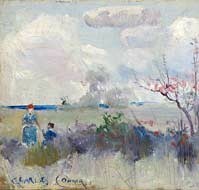 At the age of 15, Conder left school and expressed a desire to become an artist, whereupon he was dispatched to New South Wales, Australia, by his strict and very un-artistic father, in order to train under his uncle, William Jacomb Conder, a land surveyor for the New South Wales authority, with the eventual aim of becoming an engineer. He arrived in Sydney in 1884, at the age of 17. Conder preferred painting the countryside rather than wandering around in it taking trigonometrical measurements. Accordingly, in 1886, he quit the Lands Department job and found a position as a lithographic apprentice at the publishers Gibbs, Shallard & Co, where he began contributing illustration drawings for the Illustrated Sydney News, which was published by this firm. It was here that he first met artists like Frank Mahoney, Albert Henry Fullwood and Benjamin Edwin Minns. He also attended night classes at the Art Society of New South Wales (ASNSW) under the Barbizon School landscapist, A.J.Daplyn, and made the acquaintance of Victor Mann, the future director of the Art Gallery of New South Wales. He also met Julian Ashton, Sydney's foremost plein-air painter and portraitist, who invited Conder to join his sketching group on outings along the Hawkesbury River. Other influences on the young English expatriate were Girolamo Nerli the society portraitist, Phil May the English cartoonist, and Blamire Young, a teacher at Katoomba College. But his most important contact was Tom Roberts whom he met early in 1888, and with whom he went painting at Coogee Bay. It was from his interaction with all these artists that Conder developed his mastery of colour and light, as well as his outdoor naturalism and characteristically loose Impressionistic brushwork. Conder was also an acute observer, and during his stay in Sydney became fascinated with the harbour quayside and its ships. In 1888 he painted the liner SS Orient from an upstairs room of a hotel, just opposite the dock. Considered to be his finest Sydney painting, the finished work, Departure of the SS Orient - Circular Quay (1888), was shown at the annual exhibition of the ASNSW, before being purchased by the Art Gallery of New South Wales in Sydney. Later in 1888, after finalizing the sale of his painting, Conder moved to Melbourne where he met and became friends with other Impressionist painters including Arthur Streeton, and renewed his friendship with Tom Roberts. To begin with he shared Roberts' Grosvenor Chambers studio, before opening his own at Melbourne Chambers in Collins Street. Along with Streeton, Roberts and others he spent the hot summers of 1888-89 and 1889-90, plus many weekends, at the Eaglemont artist camp, overlooking the Yarra valley, near Heidelberg, about 7 miles north east from the centre of Melbourne. It was here that he honed his outdoor oil painting skills, producing works like Under A Southern Sun (1889, Meyer Collection, now in the National Gallery of Australia, Canberra), and developed a bond with his two artist colleagues that continued for many years after he returned to England. He also painted outdoors in the fashionable seaside suburbs south of Melbourne, like Mentone, where he painted his famous work A Holiday at Mentone (1888, Art Gallery of South Australia, Adelaide), with echoes of Whistler (1834-1903). In August 1889, Conder, along with Roberts, Streeton, Frederick McCubbin and Charles Douglas Richardson, showed 183 examples of their Impressionist landscape painting in an exhibition at Buxton Galleries, Swanston Street, Melbourne. Named after the 9-inch by 5-inch cigar-box lids on which the pictures were painted, the show attracted numerous brickbats from the critics. The Heidelberg painters also submitted paintings to exhibitions organized by the Victorian Artists' Society in November 1888, May 1889 and March 1890. For an overview of the Age, see: Victorian Art (c.1840-1900). In 1890, following a gift from an uncle, which provided him with enough money to study art in Paris for two years, Conder sailed for London, never to return. He spent the remaining 19 years of his life in Europe, mainly England, although he paid frequent visits to France. In Paris, he studied under Fernand Cormon (1845-1924), whose other pupils included Matisse (1869-1954), Van Gogh (1853-90) and Toulouse Lautrec (1864-1901), where he was influenced by Louis Anquetin (1861-1932), co-founder of Cloisonnism. It was during this training that Toulouse Lautrec painted Portrait of Charles Conder (1892, National Gallery of Australia). In 1894 he settled in London, but continued to visit Dieppe and Normandy where he produced numerous coastal and beach scenes. As his health deteriorated - due to the onset of tertiary syphilis - he explored lithography and devoted much of his time to producing fan designs in watercolour on silk. In December 1900, at The British Embassy in Paris, Conder married Stella Maris Belford, a wealthy widow from Canada, and for the next 5-6 years enjoyed a life of some luxury. However, for much of the time he was affected by episodes of ill-health, including paralysis and psychotic disturbances, and spent his final two years confined to a sanatorium. He died in February 1909, followed, three years later by his wife. Conder's active painting career lasted for little more than a decade (1886-96), and yet his art was highly respected by Australian painters as well as European modern artists like Camille Pissarro (1830-1903) and Edgar Degas (1834-1917). One of Australia's best landscape artists of the late 1880s, he played an invaluable role in the evolution of the first Australian school of outdoor painting. In 1991, in recognition of his contribution to Australian art, the Canberra suburb of Conder was named after him. - Springtime (1888) National Gallery of Victoria. - Coogee Bay (1888) National Gallery of Victoria. - Departure of the SS Orient - Circular Quay (1888) Art Gallery of NSW. - Herrick's Blossoms (1888) National Gallery of Australia, Canberra. - An Early Taste for Literature (1888) Ballarat Fine Art Gallery. - A Holiday at Mentone (1888) Art Gallery of South Australia, Adelaide. 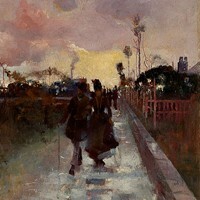 - Going Home (1889) National Gallery of Australia, Canberra. - How We Lost Poor Flossie (1889) Art Gallery of South Australia, Adelaide. 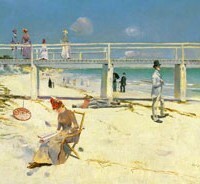 - Under A Southern Sun (1889) National Gallery of Australia, Canberra. Other works can be seen at the Queensland Art Gallery (QAG) in Brisbane, and the Art Gallery of Western Australia (AGWA) in Perth, as well as other public art museums in Britain and elsewhere. For modern Australian painting, see pictures by Russell Drysdale (1912-81) and Sidney Nolan (1917-92).  For biographies of other Australian artists, see: Famous Painters.  For more details of landscape painting in Australia, see: Homepage.